It’s been over a year since Dropbox and Google announced that they would partner to make their products work better together. 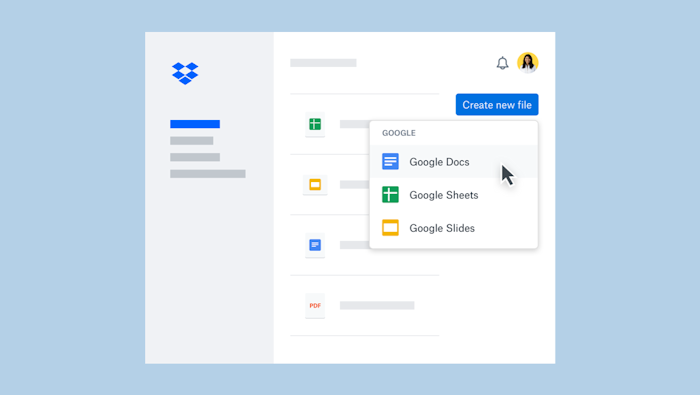 The Gmail / Dropbox integration launched last summer, and now starting today, Dropbox Business customers can participate in an open beta program that makes Google Docs, Sheet and Slides work natively in Dropbox. Using Dropbox with Google’s documents is basically the same as Microsoft Office / Dropbox integration. When you’re in Dropbox’s web view, clicking the “create new file” button will show options for Docs, Sheets, and Slides as well as the option to create new Microsoft Office documents. Clicking one of Google’s document options opens the Docs / Sheets / Slides interface. It will look like you are in Google’s page, but you are really in Dropbox. Dropbox’s wants to work with any other tool its users might be using, rather than force them into choosing between Google and Dropbox and that makes sense. Dropbox says it has “hundreds of millions” of Gmail or G Suite users who also use its own products. Dropbox obviously has a vested interest in helping it’s business customers use whatever tools they want to use. Google files that you create within Dropbox will show up on your Mac or PC, if have the Dropbox app installed there. And the files are searchable using the Dropbox app. All edits made there will be synced back to the original file and the document file type will be preserved so that anyone viewing the file who prefers to use Office won’t have any problems. Sounds great.